Most of us have an idea of the general plot of Great Expectations, having being forced to read it at some point in our high-school-English years. Boy named Pip lives with his sister and her husband. A convict named Magwitch, escaped from a prison ship, happens upon Pip and persuades him to assist with his escape. At around the same time, the local landowner, the mad recluse Miss Haversham takes a liking to Pip and arranges for him to regularly visit her and her adopted daughter Estella, who is as proud and cold as she is beautiful. Many years later, Pip comes into a mysterious fortune – the ‘great expectations’ of the title – and goes off to become a gentleman in London. He fritters away his cash without thought or plan, dragging others down with him and losing sight of the places and the people he came from. The eventual revealment of his mysterious benefactor and the resolution of the convoluted relationships breaks down what little Pip thought he knew of the world, but he finds a sort of redemption through the forgiveness of others. This latest adaptation is a BBC production with the accompanying top-level British acting talent to match. 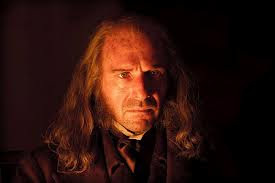 Ralph Fiennes as Magwitch the convict, Helena Bonham Carter as the disappointed and vindictive Miss Haversham fits like a glove and Robbie Coltrane as the entangled and conniving solicitor Jaggers are the leads to the smattering of familiar faces that make up the cast. As with any adaptation of classic, lengthy literature, a lot of the plot is left out or compounded. Personally, I think that in the case of Great Expectations this can only improve what was an unnecessarily drawn-out novel, issued as it was by Dickens as chapter-length installments in a magazine he wrote and published. A movie is a cut-to-the-bone version of the story and for me, this makes the interminable morbidity and accent-indulgent works of Dickens vastly improved. Along with cutting down, the movie-makers have taken great liberties with the plot, speeding up the action and doling out endings as they see fit. I understand that changes need to be made to transform a book into a film, but in this case certain lines of literary decency were definitely crossed. If I were a Dickens admirer I would likely be horrified, as I am at overly spliced adaptations of Jane Austin. As with almost all recent period pieces, the look of the film is stunning. The moors Pip is raised on are bleak and beautiful. Satis House and the great decaying wedding feast are a picture of despair, London is as dank and disease-ridden in which amongst the desperate and hateful characters, Pip's delightful friend Hubert Pocket (Olly Alexander) shines. He is one the few light, friendly characters in what is the usual Dickens dramatis personae of oily money money-grubbers, child-beaters and blackguards. 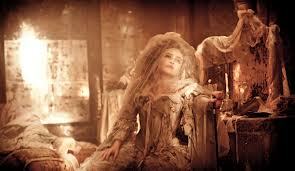 The decayed grandeur of Miss Havisham (Helena Bonham-Carter). The corruption of Pip (Jeremy Irvine, about whom I have almost no opinion) is swift and seemingly complete, shown with glaring obviousness in his embarrassment of his uncle and good friend Jo Gargary. In reading the book, Pip is not a loveable character. While you understand his confusion and naivety, you also want to knock him on the head and tell him to make something of himself and stop being such a prat. At least in the film, he has less time in which to be a prat. Decadent costuming paints a clear picture of each character. In preparing to travel to London as a 'gentleman' Pip naively dresses all in white, only to discover that like modern fashion shows, the London uniform is all black. His transformation into extravagant gentleman-of-leisure is seen most clearly in his outrageous coat collars as well as the piles of bills. Equally, from the first moment we see Estella, she is dressed is riotously extravagant and sumptuous gowns, the Christian LaCroix of Victorian England, designed to show off her as a tempting jewel to be fought over. Estella, played beautifully by Holliday Grainger, is a fiery red-head, which somehow adds to the temptation of her overall appearance. The vile Bentley Drummle (Ben Lloyd-Hughes), competitor to Pip for the esteem of Estella, wears layers of coats that were to me reminiscent of bomber jackets and he has all the swagger and confidence of a flying ace if none of the charm. Estella in her enticingly vivid gowns and gowns and ever-present jewels. It is tempting to say that at heart this is a love story, and while I suspect Dickens was a bit of an old softie when it came to romantic endings for his central characters, the plot is much too complicated and intertwined to break it down to that, as much as this version may make you think so. The movie does not have sufficient time to justify all of the sub-plots and lessons of Dickens, but it tries hard to do the book justice. If you are a fan of the book I'm not sure I would recommend the film as it may only make you angry. If like me, you've read Great Expectations but wouldn't again, certainly spend the 2 hours in a comfy seat staring at a screen.